I had the pleasure of meeting several hikers on the trail this year who had purchased and read my book. All had something in common: they did NOT have my book with them. It’s an ebook, after all, and I didn’t spot a single iPad on the JMT. It’s also a “planning” guide, not trail guide. They shouldn’t feel bad–I didn’t carry a copy of it either. Instead, I carried Eric the Black’s John Muir Trail Atlas. Although it wasn’t without flaws, overall I was quite pleased with my choice. The book is a compact eight-inch-by-five-inch volume, and is about an eighth of an inch thick. Mine, complete with 212 miles of dirt and sweat, weighs in at two-and-three-quarters ounces. Inside you’ll find twenty-five pages, printed front and back. (If one were to number each page, except for the back of the covers, it would be fifty pages.) I was NOT careful with mine, and it remained legible and without a tear throughout the trip. 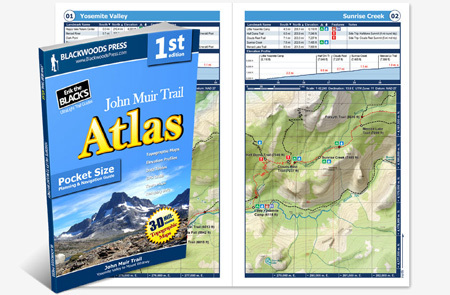 The first five pages includes a legend, a list of places from which one can resupply, an overview of the entire trail, and town maps for Mammoth Lakes, Bishop, Independence, and Lone Pine. I can see where they might come in handy, although I didn’t use any of that introductory information, except for the legend. On the sixth page the good stuff begins. The entire trail, from Happy Isles to the top of Mount Whitney (and down to Whitney Portal) is represented on forty-three pages. While the miles between landmarks was great to have, the other illustration in the second section was the weakest part of the atlas: the profiles. It’s not that the profiles were inaccurate, it’s just that the scale was compressed & inconsistent from page to page, and the effect was that I really didn’t get a feel for how steep the terrain was ahead. How important are the profiles to a hiker? Since this was my second thru-hike, it wasn’t that big of a deal–I knew what was coming. On my first thru-hike, though, I found the self-made pages I used (which were great at illustrating the climbs and descents ahead) invaluable. I would not have wanted to be without them. The last section, occupying the lower three-quarters of the page, is a 3D shaded, topographical map. On the map the location of each landmark is shown, along with a number of other waypoints. The maps also are marked so that you can determine the UTM coordinates for any location, and show possible water sources, camping areas, and other useful information. One similarity with the Tom Harrison maps: it’s cause for a minor celebration when you exit one map sheet to another, and with forty-three maps, the celebrations come quicker! A last observation: my atlas also became an augmentation to my trail journal. I noted times I arrived and left campsites and break areas, the number of other people I met during that day, where I camped, etc. That is much easier to do with this atlas than with traditional map sets. I don’t know Erik Black, but he seems like a skilled backpacker who is trying to turn his passion into a living (or at least have it contribute to his bottom line). I can certainly sympathize with that. The price is $30, which is a little more than my book, but you don’t have to carry your iPad to read it! I too used Erik’s atlas and found it extremely useful. Next time I do the JMT I will tear the pages out so I can fold them and put them in my pockets. I also had your book, Ray and enjoyed it for planning. Thanks for the review, Ray. I followed Erik’s website just before I bought your book and I’ve been planning on buying his guide once I get closer to my own hike. I keep hoping that perhaps he’ll put out an updated one in the next year but I don’t know if he has any plans for that. His gear lists and things have really helped me out too because I’m looking to very much lighten my load before I go! Thanks for mentioning the packing lists, Jill. I forgot those. I think he also has sample itineraries that may be downloaded. Good luck with your preparations! I recently purchased Blackwood Press JMT Atlas. I like it for many of the reasons you highlighted. In comparison to Tom Harrison, I like the waterproof paper Harrison uses. Also, I find that I reach for my reading glasses more frequently with Blackwood because the fonts and lines are not as legible as Harrison. This summer I will be packing The Blackwood Atlas and my reading glasses. Finally, with respect to pricing I opted for the $39.95 Blackwood “package deal”. For the incremental $10 I was very disappointed the the quality of the three “digital downloads”. For $3 less, your book is a much better source for itinerary suggestions. Thanks for the comment, Brian. I’m afraid I’m resigned to using my reading glasses to be able to tell a bear from a marmot, if they’re within a couple of feet of me. But you are right about the light lines and fonts. Speaking of the package deal, I bought the wall map, too, and my wife put it on the wall at her work so that they could track my progress. (I had a SPOT.) I never saw the map, but she said it was very nice. I purchased one when I got home. Background info. I carried a Kindle for my books and loaded it up on that as a PDF. Worked great! Wow! That’s very cool. By the way, I am a big believer in carrying an e-reader for evening, in-tent reading. I carried a Kobo Mini (which is not backlit and is very light). (UPDATE: in the original comment I called this reader a “Mobi”. That was incorrect. I am so sorry, Loren. I mixed up the name. I have a Kobo Mini. It’s very light and the battery lasted me about six days. I understand that they are not that popular here but are quite popular in Europe. I loved mine on the trail. How ironic……I was just looking at this online and was looking at picking it up. Thanks for the review. Glad the entry was useful, Chad. Happy coincidence! I have the atlas, I think its pretty nice. The issue I have is that maps, are for when you need them. You dont normally need much of a map ON the trail. You do need a map if you are confused, take a wrong trail, need to bail out, etc. As such, any map with such a limited view of the surroundings as most have, is really kidding yourself as to its utility. The lack of complete mappage of sidetrails out to trailheads is ridiculous IMO. Agree. The maps are probably sufficient to get you back on trail if you are a mile or two off, but, you’re right, they do not cover bail-out trails all the way to a road. Thanks for the comment! I am in agreement with you on pretty much all points. I find Eric’s book to be an addition to the Harrison maps, and great for jotting notes and such. I also agree with the profiles issue. Wish this was better handled. I do find that it is impossible to read without my reading glasses, and the quality of the maps is not the best, but it is still a useful little book. The town, and resupply info in it is really great, and particularly the town information can come in handy if you end up having a snafu, and need a new pair of trail runners, or something like that. I use your book for planning, and it’s top notch! But I admit, I do keep a copy on my iPhone! Great point regarding the town maps, Kathy. Thanks! I think the Atlas has its place and will work for many. Personally I prefer the Tom Harrison maps though I have carried the Atlas at times. What I like least about the Atlas is that the contour lines are unreadable, or were in his First Edition. However, his tables do give elevations of passes, junctions, crossings, etc and that partly makes up for the lack of readable contours. I’m an altimeter navigator, so is an important defect for me, less so for those who don’t use an altimeter. That altimeter will fix your position pretty well throughout the trail, except for Lyell Canyon, where there’s a looooooong way between contour lines. Thanks for the comment, John! Hey Ray, first off GREAT blog! I really enjoy reading your topics. Like most, I’m a big fan of Eric’s map books and I also have his PCT atlas’. What I have done with mine is take them to the FedEx store (formally Kinkos) and have them trim the binding off and replace it a spiral binding. This allows you to fold over the pages on themselves. This makes easier to read/view without that hard original binder and nothing is lost from the cut. It only cost $5 to have it done. Thanks for the kinds words, Oscar. Deeply appreciated. I love your binding idea. In fact, I might take it a step further and have just a bit trimmed off each side so that it fits better in my pocket. That was a complaint I had that I didn’t write about in my review, because it was my pocket’s fault, not the atlas’s. Can anyone recommend the best territorial map that includes road access to trailheads? I realize this is asking for bulk and weight but feel to be safe in the wilderness one should know how to bail out if needed. Plus so many times on the Yahoo JMT forum, people refer to trail access options but unable to find road access to these places on Harrison, Wendt or Erik the Black maps. That’s a great question, Lori, and I can’t really recommend anything. Why don’t you let me take this on as a possible blog post, in the future. Thanks! Ray the first thing I bought a few years ago on the JMT was this Atlas. It has taken me longer than expected to finally have the time to get out west to hike it. As you noted the Atlas has a lot of valuable information so I will be taking mine on the trail. When I first started reading it I had the feeling the trail didn’t have a lot of hard climbs due to the scale on the profiles. It wasn’t until I started doing a lot more research that I realized there will be a lot more climbing and descending on this hike. If all one did was look at the profiles in this Atlas, I’m afraid they would be very disappointed on the hike. Except for a few short stretches, you are always climbing or descending! Thanks for the comment, Chip.